"Mirbeau's novel offers trenchant satire that will endure." See more at: http://www.nyjournalofbooks.com/book-review/twenty-one#sthash.Y4Qy7ZyJ.d... the best cure for a man who hates the mountains? Send him to the mountains. What's the best cure for a misanthrope? Send him to live with other people. Thus begins Twenty-One Days of a Neurasthenic by Octave Mirbeau (1848–1917). 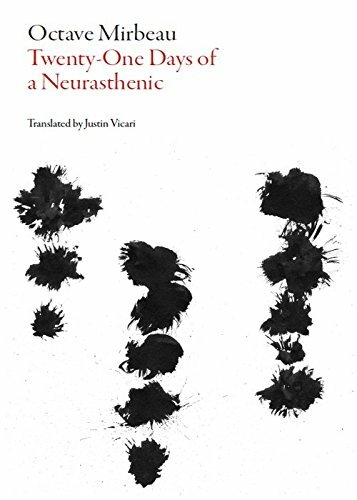 Neurasthenic, written in 1901, receives a modern translation from Justin Vicari. Mirbeau wrote his acerbic satire of French hypocrisies on the heels of two other groundbreaking novels, The Torture Garden (1899) and Dairy of a Chambermaid (1900). Mirbeau constructs a story around one Georges Vasseur, misanthrope and mountain-hater, while he undergoes a rest cure for neurasthenia in a sanatorium in X. As Vicari explains in the Introduction, neurasthenia was an illness that “encompasses nervous disorders, neurological symptoms, anxiety, paranoia, and other types of neurosis.” A good catchall mental affliction that is perfect for tarring those with unpopular opinions about the glorious French Republic. Neurasthenic does not fit into the standard mold for the 19th century novel. The skeletal plot has Vasseur simply passing the time and listening to his fellow residents. Mirbeau weaves together dramatic vignettes, reminisces, stories, and rants. Vasseur meets quacks, murderers, imperialists, and intellectuals. All turn out to be hypocrites. Vicari likens Mirbeau's scorched earth satire to Aristophanes, Jonathan Swift, Louis-Ferdinand Céline, and William S. Burroughs. Those familiar with the “dark poetry” of Bill Hicks and the stand-up of George Carlin would appreciate the mean-spirited drubbing Mirbeau gives this Boschian tableau of human awfulness. Mirbeau, like George Carlin, is an equal opportunity offender. Not only does he satirize the hypocrisy of military imperialists, con-artist aristocrats, and skeevy anti-Semites, but he also harpoons the bourgeoisie and the ugly (usually one and the same). Case in point, Vasseur listens to a man wrongfully accuse and imprisoned for several years. When Vasseur compares the man's plight to Captain Alfred Dreyfus, the man suddenly changes mood and shouts, “Long live the fatherland! Death to the Jews!” (The Dreyfus Affair, the cause célèbre from the 1890s, is used by Mirbeau to ferret out those he deems worthy of contempt.) Mirbeau had legitimate bones to pick with Anti-Dreyfusards, imperialists, and royalists, since he possessed Anarchist and Socialist sympathies. Vicari's translation operates with the modern reader in mind. He chose not to present the novel as a historical relic, enlarding the text with footnotes. This strategy works brilliantly because Mirbeau's prose works best when let loose. Like Céline's comic novels, Neurasthenic chugs along with a frantic energy. Vicari had to adapt the text somewhat, making explicit what was implied in the French, or by adding neologisms and anachronistic references. While these might take away from a more literal translation, The Dalkey Archive Press has succeeded in producing an important adaptation of Mirbeau's novel. Translation is a delicate balancing act, the final product being both of its time (1901 in France) and modern-day (2015 in the United States). Translations, like slang dictionaries, need periodic updating, the chaotic mutations of language turning the cutting-edge into the obsolete in a few short years. The Vicari translation of Neurasthenic doesn't face immediate obsolescence, because Mirbeau's novel offers trenchant satire that will endure.